High quality, embossed. White. 9-1/2 x 9-1/4 sheet size. High quality, embossed. Brown. 9-1/2 x 9-1/4 sheet size. 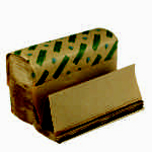 Recycled, minimum 40% post-consumer paper. 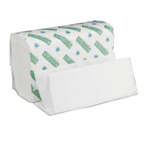 Green Seal-certified Boardwalk® Green embossed folded towels are 100% recycled. Natural towels contain up to 82% post-consumer waste. Boardwalk® Green Plus Green Seal-certified embossed folded towels are 100% recycled and contain up to 43% post-consumer waste content. Meets EPA standards with a minimum of 40% post-consumer waste. One-ply towels. Soft and absorbent. White. 9.2 x 9.4 sheet size. Environmentally conscious. Meets EPA standards with a minimum of 40% post-consumer waste. One-ply towels. 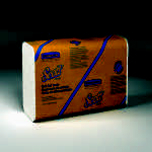 Depend on Scott multi-fold towels for reliable performance. White. 9.2 x 9.4 sheet size. Environmentally conscious. High-quality folded towels are thicker, stronger and more absorbent, so you use less. One-ply towels. 9-1/2 x 9-1/8 sheet size. Environmentally conscious.